Links updated 22 Feb. 2009 and 5 March 2009. Static screenshot below. View the interactive version. Move the sliders to set the values of your principal, interest rate, loan length, and mortgage start date. Up and down arrows at either side of the slider allow the range of values covered by the slider to be adjusted. 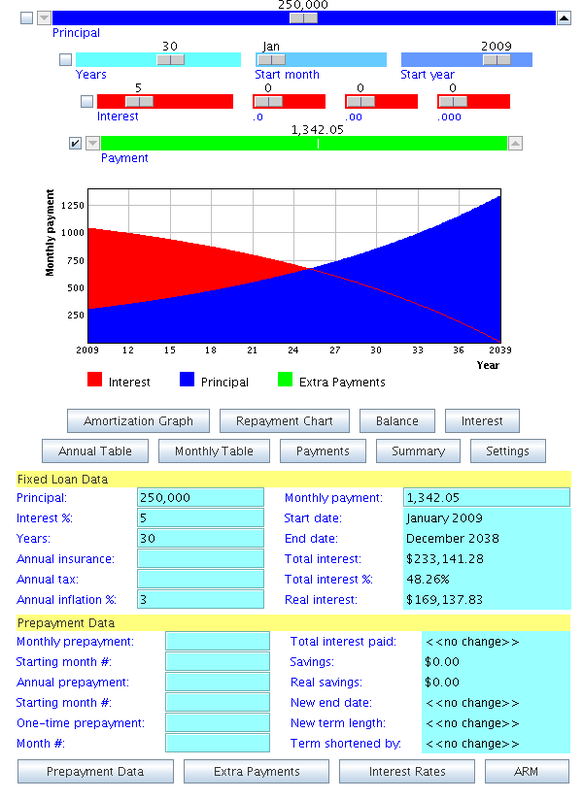 The checkboxes on the left of the sliders determine whether principal, interest, term or payment is calculated. By default, the Payment slider checkbox is ticked, meaning that moving the other sliders’ values will calculate the payment. Clicking on another slider checkbox, e.g. Principal checkbox, allows the user to modify term, interest and payment to see the Principal value calculated as these other values change. Amortization Graph – this shows how the monthly payments made each year are broken down. Note how the curves show increased principal and decreased interest being paid as time goes by. Also note that extra payments “push” up the principal curve, i.e. the annual principal amount shown is increased by the value of the extra payment. Repayment Chart – the percentage breakdown of the total payments made over the entire mortgage (or indeed, the breakdown of the average monthly payment). Balance Graph – this shows the balance outstanding over the term of the mortgage. It is useful when extra payments are made to visually see how much sooner the mortgage is paid off, and how quickly the balance drops. Interest Graph – this shows the rate of interest used over the term of the mortgage. Annual Amortization Table – how much interest and principal you pay each year. Monthly Amortization Table – how much interest and principal you pay each year, broken down month by month. Monthly Payments Table – the payment amount and any extra payment made each month. Useful when interest rates change or if extra payments reduce monthly payment. Summary – shows a summary of the current values. Monthly/Bi-weekly payments – Limited support for bi-weekly mortgages is present through this option. When Bi-weekly payments are selected, an extra 1/12th payment is made every month. This equates to making 13 monthly payments every 12 months – a close approximation of how a typical bi-weekly mortgage will work (52 weeks / 2 weeks = 26 half-monthly payments == 13 monthly payments). Note that extra payments are always considered monthly payments, so no equivalent bi-weekly approximation is made. Extra payments – default is to reduce term when extra payments are made, but alternative is to keep term unchanged and reduce monthly payment instead. Interest sliders – You can use either 1/8th increments or decimal places. Dynamic/static – Dynamic calculation means that calculations are done as you move the slider; this is the default. Static means that the calculations are done when you’ve finished dragging the slider. The Fixed Loan Data section stays constant while the other four sections can be chosen using the buttons at the bottom of the calculator. Fixed Loan Data – use this as an alternative to the sliders for entering values. This section is called fixed because it does not take interest rate changes into account. The annual Tax and Insurance fields are simply divided by 12 and added to the monthly payment amount. The inflation figure allows estimates in real terms (i.e. in “today’s money”) to be calculated. The total interest paid over the entire mortgage is shown on the right hand side along with the total interest paid as a percentage of all payments made (see the Repayment Chart for a graphical view). Finally, the total interest paid in real terms (“real interest”) is displayed – this figure is an attempt at calculating how much the total interest paid is worth in real terms. Prepayment Data – this section gives you the opportunity to estimate how you can shorten the term of your mortgage by making either a single one-off payment or continuous extra monthly or annual payments. You must enter a starting month for the prepayment to take effect. The format is simply the month number i.e. 1 for the first month, 2 for the second month and so on. On the right-hand side, the Savings field shows you how much money you will save, while the Real Savings field once again uses the inflation rate to give a rough estimate of what these savings are in real terms given that the interest savings are spread over a number of years. The dates shown reflect what happens to the mortgage term when the extra payments have been factored in. Extra payments – add up to six extra one-time payments, giving the start and end months numbers to indicate the period when the extra payment is to be made. Interest rates – add up to five extra interest rates, giving the start and end month numbers to indicate when the interest rate is active. Months outside these ranges will use the fixed loan data interest rate. To specify a period where no principal is paid, enter a start and end month in the interest-only payments section. ARM – Adjustable Rate Mortgage support is provied in this section. Enter a start month to activate and click on the interest rate graph to view how this section alters the interest rates over the term of the mortgage. Enter the nominal interest rate not an APR. All calculations are performed on a monthly basis. The figures are estimates only – your lender’s figures will vary!